Cambridge, UK, Jan. 19, 2015—AVEVA today announced that it has entered a multiyear agreement with Statoil ASA for AVEVA Everything3D (AVEVA E3D). The Norwegian Energy owner operator has selected AVEVA E3D to be its strategic 3D design software platform. Following the migration to AVEVA E3D by a number of other companies, Statoil selected it as the natural upgrade of its existing design system, AVEVA PDMS. Statoil will benefit from improved design efficiency and AVEVA E3D’s simple migration from AVEVA PDMS, means there will be no disruption to existing projects. This will give Statoil and its contractors the possibility of cutting project schedules and reducing rework during both the design and construction phase. Statoil has been a strategic user of AVEVA PDMS and AVEVA Global for more than 15 years and acknowledges the value this software has brought when executing field development, maintenance and modification projects as well as during the operation and revamp of its portfolio of facilities. Moving forward AVEVA E3D will give Statoil the possibility to meet the future demand of cost effective project execution, utilising its integration with high-definition laser survey capabilities, comprehensive clash detection and improved design and drawing capabilities. 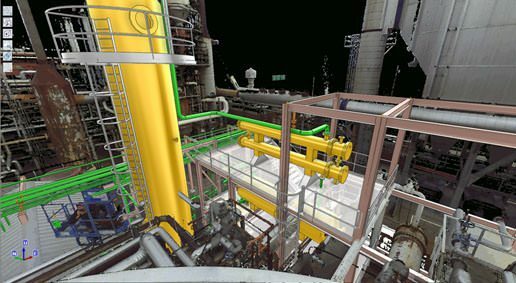 As existing users of AVEVA PDMS, it’s compatibility with AVEVA E3D, ensured that Statoil can migrate and access the 3D design for both new and existing facilities in a flexible and controlled manner. Statoil is currently using AVEVA software on 52 Brownfield and 7 Greenfield models plus the new Johan Sverdrup field development project that today consists of 7 models. Older plants such as Snøhvit LNG Plant in the Barents Sea, the refinery at Mongstad in Norway and Kalundborg in Denmark, and the gas treatment facility at Kårstø have been converted to AVEVA PDMS. Statoil’s new strategy to standardise on AVEVA E3D offers the potential for significant project efficiencies in the design, operation and revamp of all Statoil facilities in the future. For almost 50 years, AVEVA software has enabled the creation of some of the world’s most complex power and process plants, vessels and offshore facilities. AVEVA’s Digital Asset approach ensures there is always an accurate digital representation of each physical asset. This allows engineering contractors, Owner Operators and shipbuilders to work more safely, more efficiently and with less risk throughout the life cycle of their projects and operations. AVEVA is the proud winner of the Frost and Sullivan 2015 Global Engineering Information Management Solutions Competitive Strategy Innovation and Leadership Award. For further information please visit www.aveva.com/ednotes.